No matter what the emergency, communications remain a vital component to keeping America safe, secure, and resilient. Bipartisan measures have been introduced in the House and Senate proposing a cooperative-federalism approach to the regulation of Unmanned Aircraft Systems. Specifically, below 200 feet in altitude, state, local, and tribal authorities could reasonably regulate the time, manner, and place of drone operation. This authority would permit local governance of low-altitude drone activity in a manner similar to traffic management. President Donald Trump has also signed a presidential memorandum establishing pilot programs for commercial drone operations that would require the participation of state and local authorities. Congress should reject overblown concerns about a regulatory “patchwork” and adopt a cooperative-federalism approach that leverages the unique competencies of state, local, and federal officials to foster a competitive, safe, and innovative drone industry. President Trump became the first national leader to call for protecting the U.S electric and communications grid against an electromagnetic attack like one practiced in North Korea. Deep in his new national security strategy released this week, he made good on a campaign promise to move quickly to make the fixes that proponents have long called for. China, Russia, Iran, and North Korea. Weeks after Harvey, the Harris County Sheriff's Office says they are facing delays answering 911 calls. In some cases, it could take minutes to speak with an operator. The sheriff's 911 operators were relocated to the Greater Harris County 911 Emergency Center after flooding at the sheriff's emergency dispatch center. A recent study found that FEMA failed to capture 75 percent of flood damages within their flood maps between 1999 and 2009. The FEMA flood maps are the primary source for how the government and insurance companies evaluate flood risk and insurance premiums. There are collectively trillions of dollars worth of property that rely on these maps being accurate. Great example of handling the media by the HCFMO. What in the world does the frightening news about the Oroville Dam in California have to do with America’s electric grid? Answer: the Federal Energy Regulatory Commission (FERC). 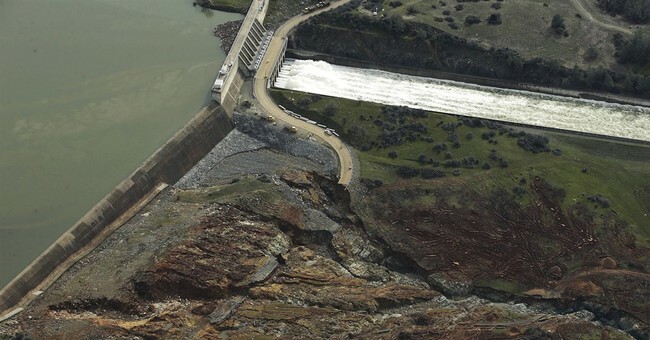 The California state government is scrambling to address the failing dam after heavy rains have damaged the main concrete spillway and water is now pouring over the emergency spillway for the first time in history. The erosion of the natural barrier –? the last line of defense between Californians and the emergency spillway ?? has prompted the evacuation of some 185,000 residents. Some outlets are even reporting that the dam might very well break, a mini-doomsday scenario for those in the immediate vicinity of the deteriorating infrastructure.